What would you do to increase your trading profits by as much as 50%? Most traders and investors would do whatever it takes. Those same traders will much to often what the profits earned with their blood, sweat and tears shrink considerable as they prepare their tax returns. You have in your hands the easy-to-use tools that will protect your hard earned assets. Packed with proven strategies that reduce your tax exposure this comprehensive guide is completely updated with information and strategies for the most recent tax changes. How to integrate the "triple crown"-Tesser's latest strategy for tax avoidance and wealth accumulation-into your trading plan and much more. Keep the profits you work so hard to earn, whether from trading, investing, or hard work-and take control of your financial destiny. The NEW Trader's Tax Solution has puts years of experience at your fingertips. 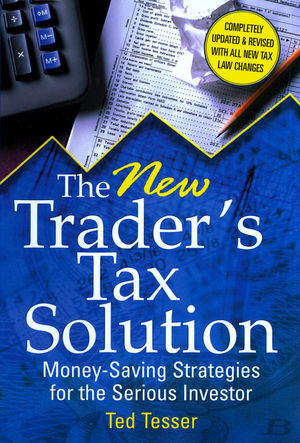 Whether you are looking for last minute tax saving tips or trading techniques that position you for the optimal tax reduction, The NEW Trader's Tax Solution is a must-have addition to any trading library. Get the government to pick up the tab on this years trading profits, foot the bill for any trading losses, and increase your wealth by 50%, instantly. After putting Trader Status on the map, Tesser now takes it to another dimension, complete with real world case studies, illustrations, templates, and filled-out, ready to be filed tax forms. Ted Tesser, CPA, is a partner with Tesser, Horowitz, and Ullmann, Inc., a firm serving clients around the world. He specializes in investment taxation, is an active trader, and is the author of Trader's Tax Survival Guide and the best-selling video Cut your Trading Taxes in Half!